Editor’s Note: Dr. Scotty Butcher of the BOSS Strength Institute submitted this research review to the Russells’ Blog. In this article, Dr. Butcher critiques a newly-published study in the NSCA’s Journal of Strength and Conditioning Research. I recently read with great interest a new paper led by Dr. Andrew Jagim, Assistant Professor of Exercise & Sport Science at the University of Wisconsin-La Crosse, titled “The physical demands of multi modal training competitions and their relationship to measures of performance.” They wanted to know what the physical demands of multimodal training (MMT) competitions were and if there was a relationship between those demands and selected measures of athletic performance. Researchers are starting to study functional fitness competitions. 3) a long chipper-like grinder involving 10 reps stations of OHS, box jump overs, thrusters, power cleans, toes-to-bar, and burpee chest-to-bar pullups, then repeating the first five in reverse order. 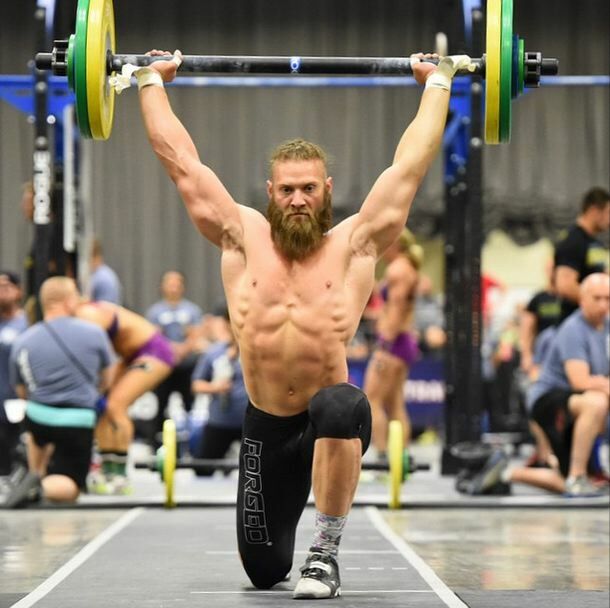 It’s not mentioned in the paper, but I contacted Dr. Jagim and he confirmed that this competition took place in a CrossFit box and used CrossFit Level 1 Trainers as judges. The participants were CrossFitters with at least six months of CrossFit experience. There were 18 participants (10 males), who averaged 38 years of age (range 21-52) with fairly low VO2max scores (average of 38 ml/kg/min with a standard deviation of 7; which means that about 68% of the subjects fell between 31 and 45 ml/kg/min). It is interesting to note that the female participants had a much lower VO2max (33 ml/kg/min) than the males (42 ml/kg/min). You’ll note that these participant data have a large individual variation, but are at about an average or lower level of cardiovascular fitness for healthy individuals. The participants completed a baseline testing day which involved testing their body composition (muscle and fat mass), vertical jump height and VO2max. Two to ten days later, participants completed the competition, during which the researchers examined their heart rate (HR), blood lactate and rate of perceived exertion responses, while the judges recorded their time or final 1RM. 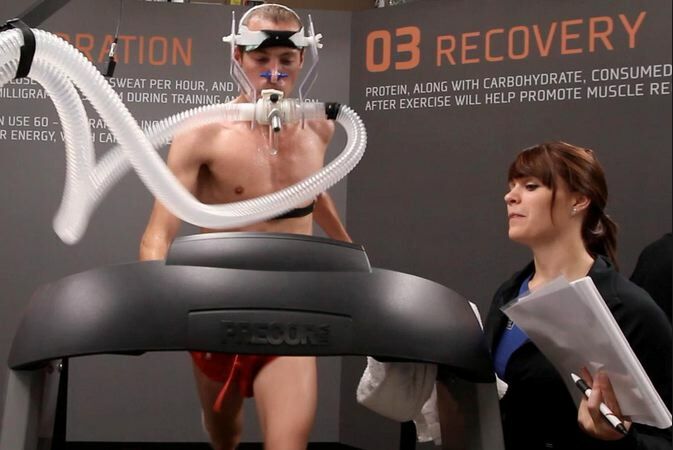 The researchers used the baseline VO2/energy expenditure data and heart rate responses to calculate the energy expenditure and VO2 responses during each event. This study examined if VO2Max results and vertical jump tests correlated with fitness competition performance. 1) Average event scores for events 1-3 were 11:15 min, 165 lbs, and 7:18 min. 2) Events 1 and 3 resulted in average heart rate responses of 92 and 95% of maximum, respectively, indicating a large cardiovascular response to the events. 3) Change in lactate (a marker of the degree of anaerobic work performed) for events 1 and 3 were 12 and 10, respectively. The researchers state that these lactate changes represent values similar to those obtained by competitive martial artists during their sport. 4) There were no associations between the HR, energy expenditure, or lactate responses during the competition and the baseline physiological data. 5) The only associations found for performance data were between the event scores (time to completion or 1RM load) and baseline VO2max and muscle (jumping) power for all three events. In other words, the athletes with greater VO2maxes, and those who jumped higher, did better on average in the fitness competition. Muscle mass also had a small association with performance of events 1 and 3. Therefore, the authors concluded that a combination of muscle power and VO2max contributed the most to MMT performance and suggested that it may be beneficial to increase VO2max and lower body muscle power to improve in MMT competition. This is a neat little study which, to my knowledge, is the first to quantify physiological responses in CrossFit participants during a fitness competition, although some researchers have previously quantified some basic responses during CrossFit workouts. 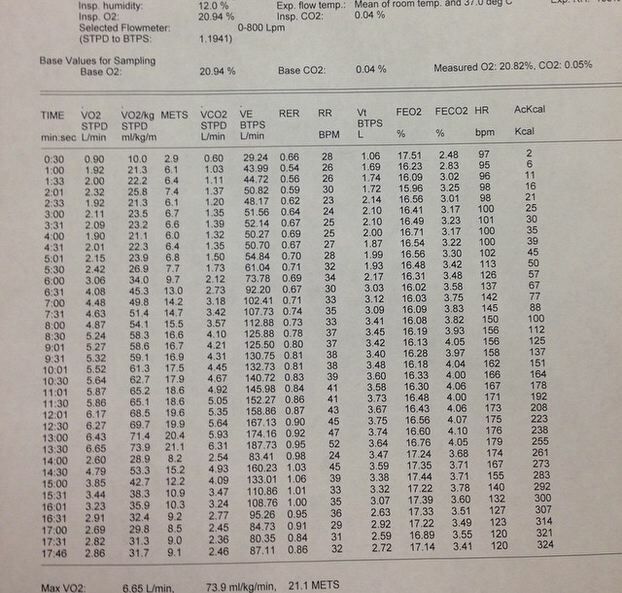 The high heart rates and lactate values during events 1 and 3 are certainly no surprise to anyone who has done Helen or a grinding chipper, but it is nice to see these results quantified. This is the main positive finding in the study. Examining the correlative (association) data is interesting, but a bit tricky for several reasons. First, as mentioned, there is a large variation in the participant characteristics in regards to both age and VO2max values. In addition to these characteristic data points, if you compare the event 1 scores to the Helen scores posted by elite CrossFit Games participants, it is obvious that the study population, with an average of 11:15, is far from elite. Even at the Regional level, average Helen scores are around 7:30-8:30. 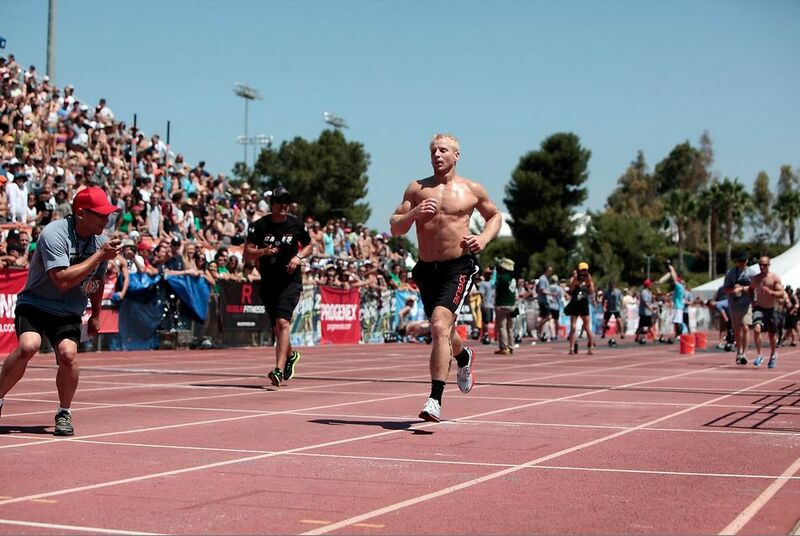 Competitive CrossFit Games athletes can complete Helen over 4 minutes faster than this study’s average time. All participants had a minimum of 6 months of CrossFit training experience, but there is no indication in the paper as to the exact level or quality of their experience. More experienced participants may not demonstrate such a relationship between the physiological characteristics and performance. Therefore, these results may not apply to those who already have high levels of strength or VO2max, or to higher-level CrossFit athletes. Second, use caution in interpreting the Jagim study’s estimates of energy expenditure during the competition. Although their method has been validated for moderate intensity physical activity, it may be inappropriate for high intensity or anaerobic work. Energy expenditure estimates that only use aerobic data have been shown to grossly underestimate energy expenditure during activities with a strong anaerobic component. When looking at their lactate responses for events 1 and 3, they state that the levels reported are similar to those obtained during other anaerobic events such as with competitive martial artists. Given the study participants were lower level CrossFit trainees, this comparison is likely invalid. Third, contrary to their second purpose, there were no associations between physiological data collected during the competition (i.e. heart rate and lactate) and baseline fitness variables (i.e. VO2max, body composition, and vertical jump power). Unfortunately, the authors do not address this in their discussion. Only the final performance scores (i.e. event times and 1RM loads) correlated with baseline fitness data. This is a subtle, but important distinction. It is likely that those who perform better on competitive events (i.e. have greater work capacity) also will perform better on fitness testing. One goal of CrossFit training is to improve the ability of trainees to perform well on any physical test, and this may simply be an example of this. Finally, and most important, the authors make an egregious error of causation in the interpretation of their correlation data. 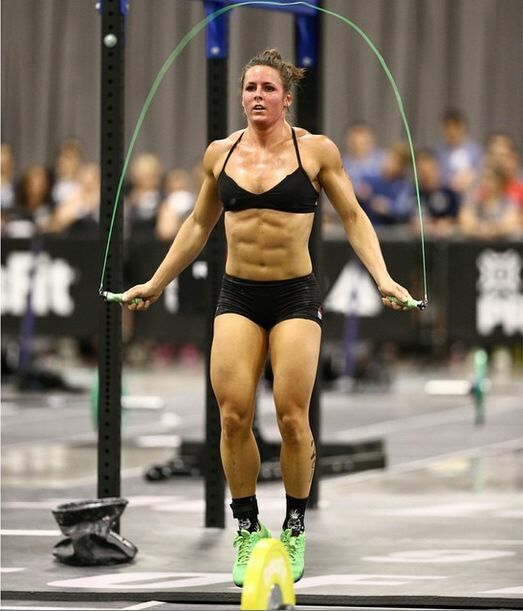 Because the performance scores were associated with muscle power and VO2max, they state that training to focus on improving muscle power and/or VO2max will enhance performance, particularly on Event 1, aka “Helen.” They later state that individuals with greater leg power and lean mass would be better suited for MMT (CrossFit, in other words). While this hasn’t been demonstrated with research, CrossFitters are well aware of the fact that training using CrossFit methodology has a large impact on aerobic abilities and muscle strength and power. It is very likely that CrossFit trainees will increase VO2max with training, but I have a hard time believing that your performance on fitness competitions would increase if you trained solely to increase VO2max without doing training designed to increase work capacity. Even in sedentary individuals, increases in VO2max have no relationship with improvements in endurance performance. As I mentioned, assessing this in CrossFit athletes has not yet been reported empirically and would be a very interesting study to say the least. In relatively low-trained CrossFit participants, muscle power and VO2max have moderate to large associations with performance in a fitness competition. Whether or not this relationship holds true in more well-trained participants remains to be seen, as does whether or not training to focus on muscle power or VO2max specifically would have any impact on performance in fitness competitions. Dr. Scotty Butcher, BScPT, PhD, ACSM-RCEP, is an Associate Professor at the University of Saskatchewan and co-owner of BOSS Strength Institute. He has over 15 years’ experience prescribing exercise to untrained clients and athletes alike. 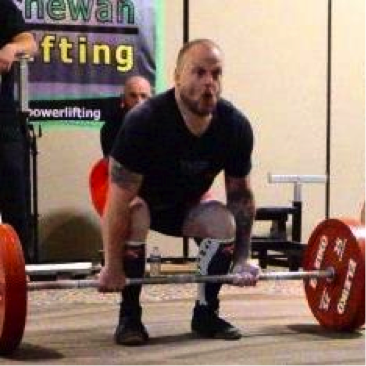 Formerly certified as a CSCS, dabbling in CrossFit training, and currently a budding competitive powerlifter, he has a passion for strength training and translates this to promoting quality exercise training and rehabilitation practices through research and education. Connect with Dr. Butcher on Twitter @InkedProfScotty.